Victory Day hits a raw nerve among Russians, likely owing to the fact that the vast majority of Russian families have been acutely impacted by World War II. President Vladimir Putin recently tapped into this widespread sentimentality with a rare act: he penned a family history, published in this month’s edition of Russkiy Pioner magazine, recounting the harrowing tale of his own family’s struggle to survive. At the start of the war, Putin’s father – also named Vladimir Putin – joined a small detachment of soldiers tasked with carrying out acts of sabotage, targeting bridges, railways, and other strategic points. Due to an act of betrayal, the detachment was almost immediately discovered and ambushed by Nazi forces. As the Germans chased the Russian fighters through the woods, Putin Sr. managed to escape. He spent hours hiding in a swamp, breathing through a reed, waiting for the last of the enemy combatants to depart. Shortly thereafter, the elder Putin was deployed to Nevsky Pyatachok, one of the Leningrad siege’s most blood-soaked battlefields. He was gravely wounded there. For the rest of his life, shrapnel would remain embedded in his leg. During a period spent recovering in a Leningrad hospital, his son – Putin’s brother – succumbed to diphtheria. He was buried in the city’s Piskaryovskoye Cemetery, where the remains of some 470,000 civilians and soldiers remain amassed among dozens of mass graves. When Putin visits St. Petersburg, he often lays flowers at one of the cemetery’s mass graves, where his brother is believed to be buried. Leningrad endured the deadliest siege in history. Starvation claimed hundreds of thousands of lives between 1941 and 1944. Upon returning from the hospital, Putin Sr. found medics lugging corpses from the building he lived in to be buried. He then spotted his wife in the medic’s clutches. She was still breathing. He ambled toward them on his crutches, screaming that she was still alive. The medics told him it was only a matter of time – that she would soon pass on. He attacked them with his crutches, demanding that they put her back inside. She would survive, ultimately giving birth to Russia’s future president in 1952. She lived until 1999, and his father until 1998. Putin has described some of these memories before, including to U.S. presidential hopeful Hillary Clinton, who mentioned the conversation in her latest book. Over the years, many analysts have speculated that the impact of the war on his own family has largely shaped Putin’s worldview, reinforcing fears of betrayal and his loyalty to a close-knit group of friends and allies. The war has left an indelible mark on Russia’s national identity. According to a recent survey conducted by Moscow-based pollster the Levada Center, 52 percent of Russians said in the same poll that at least one of their relatives had died in World War II. Many others grew up hearing their parents’ or grandparents’ tales of struggle and tumult. Perhaps unsurprisingly, the same poll revealed that 42 percent of Russians view Victory Day as among the most important days of the year, trumped only by family-oriented days such as New Year’s Eve and birthdays. The poll further revealed an uptick in patriotism with regard to Russia’s role in the war. Some 69 percent of Russians believe the Soviet Union could have achieved victory without the help of its wartime allies, a 12 percent increase as compared with the same question five years ago. The poll was conducted among 1,600 respondents with the margin of error not exceeding 3.4 percent. 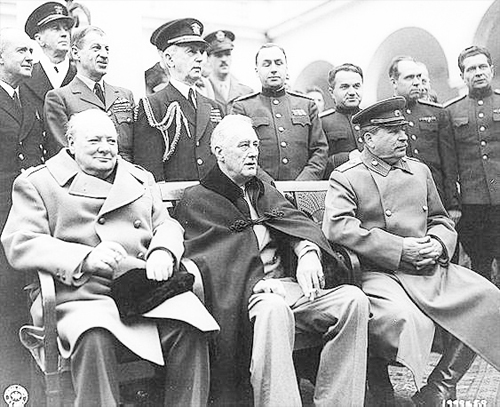 The latter finding reflects a decisive shift in Russia’s historical narrative, which makes sense in light of the fact that the country’s official interpretation of the history of World War II has transitioned over time, often in connection with foreign and internal policy goals. During the Perestroika era, Russia’s role in the war was broadly championed as part of a collective effort effort to crush Nazism alongside Moscow’s Western allies. At that point, the actions of Stalin and the Communist party were interpreted negatively, the typical view being that the Russian people won in spite of – not because of – the party leadership. Popular television series of the day centered on the theory that the war effort was hampered by mass repression and the incompetence of the Soviet leadership. This interpretation has gradually changed, ultimately leading to an entirely different popular understanding of the war. “The current interpretation is that we are the main victors in this war, while the allies played a secondary role. The whole world owes us for saving it from Nazism, this interpretation goes, something it is currently ungrateful for,” Alexei Makarkin, deputy head of Moscow think tank the Center for Political Technologies, said in comments to The Moscow Times. As Russian pride in the victory surges, Moscow is gearing up to host the largest Victory Day parade in post-Soviet history. In a recent interview with RT, Sergei Ivanov – Chief of Staff of the Presidential Executive Office and Chairman of the Victory Day organizing committee – said a total of 28.5 billion rubles (about $562 million) had been allocated for Victory Day celebrations, though the majority of those funds have been earmarked for veterans. “I would like to stress one very important point: this money is mainly allocated not for the [celebration] itself; it’s allocated for the veterans. To be exact, 12.5 billion rubles are for housing for the veterans… And the next sum, 12.3 billion rubles, is allocated for social benefits for the veterans. So the minor part of the whole budget is allocated for different events,” Ivanov said in the interview, the transcript of which was published on the Kremlin’s website. News site RBC estimated that some 7 billion rubles would be spent on advertisements, fireworks, concerts, monuments, medals and on large-scale military parades across Russia. Moscow’s parade will feature the newest Russian weapons, including the RS-24 Yars systems, which can carry up to 10 independently targetable nuclear warheads, RIA Novosti reported. In addition, 732 foreign soldiers will march across Red Square. According to Vladimir Gelman, a professor of political science at the European University in St. Petersburg, there is a need in Russia for a visible manifestation of the country’s strength – something rhetoric alone cannot offer, but that the parade can. “The understanding is that the only way for [Russia] to make sure we are seen as a great power is by visibly demonstrating our strength,” Gelman told The Moscow Times in a phone interview.